These two items belong in every house (and every automobile too)! It seems like someone comes up with a new tool or gadget every day that promises to transform your life by making some everyday task faster and easier. These hot new “must-have” items always work flawlessly in the TV commercials, but when we buy one and actually try it out we’re often disappointed with the actual results. I’ve tried enough of these so-called hot miracle products over the years that I’m now quite skeptical of every new one that comes out. That’s why when I happen to find one that really does work as well as the ads claim I make it a point to tell everyone I can about. Well, today I’m going to tell you about a couple of products that really do live up to the hype: Gorilla Glue and Gorilla Tape. The first time I saw a commercial for Gorilla Glue I just assumed it was yet another variation of “super glue” (which I’ve always found to be far from “super”). I watched those semi-humorous Gorilla Glue commercials for at least a year before I finally decided to give it a try. Well, I’m glad I tried it because I can honestly say it blew me away! I’ve used this stuff on everything from busted fuel cans to broken eyeglass frames and it has never let me down even once. It sticks to virtually any surface and texture, and once it bonds it doesn’t let go! After I’d been using Gorilla Glue for a while I saw a commercial for something called Gorilla Tape. Apparently the company decided to replace the glue on regular duct tape with Gorilla Glue and market it as Gorilla Tape. Naturally, I had to give Gorilla Tape a try since I had been so impressed with Gorilla Glue. And once again, I was delighted with the results. My assumption about how they made Gorilla Tape turned out to be way off the mark. They didn’t just replace the glue on regular duct tape with Gorilla Glue. They actually made the tape itself thicker and stronger. And like Gorilla Glue, once Gorilla tape bonds with the materials you tape together, it stays! I’ve used Gorilla Tape for a wide variety of purposes that range from repairing a busted coolant hose on my car to hanging pictures on a wall. Using Gorilla Tape is pretty straight-forward, but if you’d like to give Gorilla Glue a try I recommend watching the short video below for some tips on using and storing it. ﻿ Bottom line: No products I have ever used lived up to the hype in the commercials better than Gorilla Glue and Gorilla Tape. I’ll never again be caught without having one of each in both my garage and my vehicle! 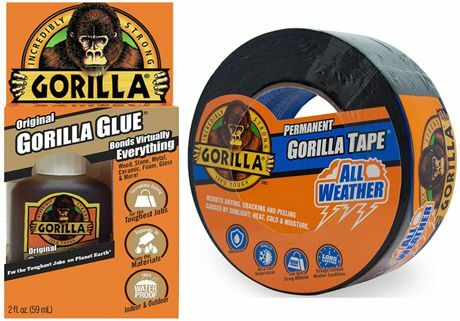 You’ll find both Gorilla Glue and Gorilla Tape at most any local retail store as well as online at Amazon. I’m Rick Rouse, an A+ certified computer tech and long-time blogger. I really enjoy learning new things and interacting with my readers. I also love helping you quench your own thirst for knowledge! Ever wondered why most farmers paint their barns red?